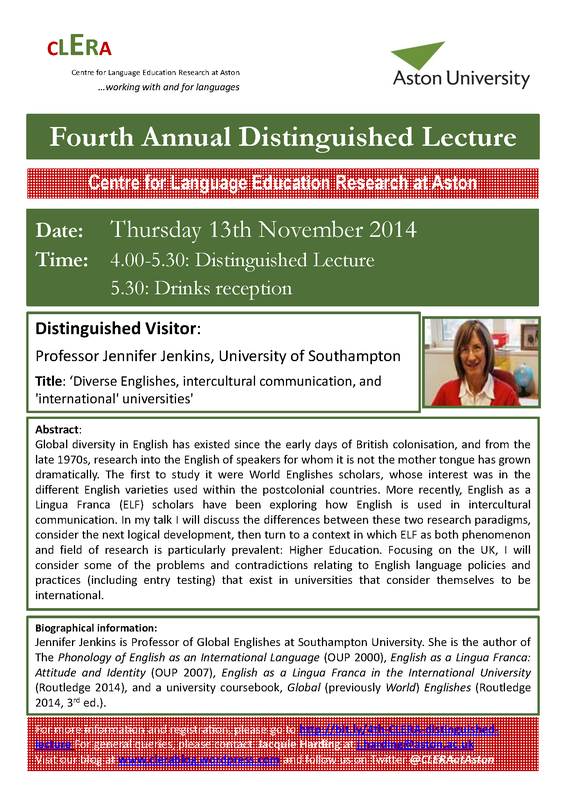 On Wednesday May 22, 2013, CLERA’s Distinguished Visitor Professor Juliane House (Hamburg University, Germany) will give a public lecture titled “English as a global lingua franca: A threat to multilingualism and translation?” at Aston University. Professor Juliane House is Professor emerita of Applied Linguistics at Hamburg University and and a senior member of the Sonderforschungsbereich “Mehrsprachigkeit” (Research Centre on Multilingualism), where she directs projects on translation and multilingual business communication. She also directs a project on multilingualism and multiculturalism in German universities. Her research interests include translation theory, contrastive pragmatics, discourse analysis, English as a lingua franca and intercultural communication. For more information about the event, visit the CLERA website. Room change! Event will take place in MB753.